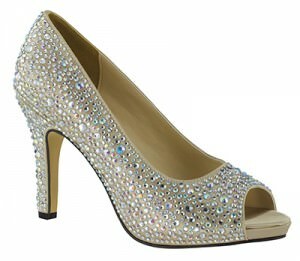 Looking for the perfect shoe to match your amazing prom dress? 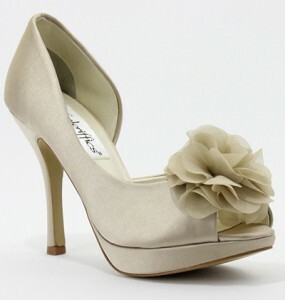 We offer a wide variety of heels that will perfectly match your gown. From platform and peep toe to kitten heels and sandals you can always find something that will rock your feet in a comfortable fashion. 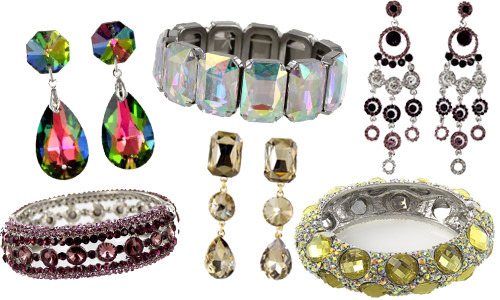 Do you like jewels, lace, sequin or patent? Look no further we have what you are looking for. Trend Alert! Embellished Sneakers for Spring and...Prom? There is a fabulous foot trend that has everyone talking! From the runways to the streets, designers and celebs are opting for some fancy footwork...and they're not high heals. They're rocking embellished sneakers! With Spring 2014 just around the corner, it's the perfect time to try new trends out, and ditching your typical cross trainers to add instant glam to any outfit is certainly a great way to start! 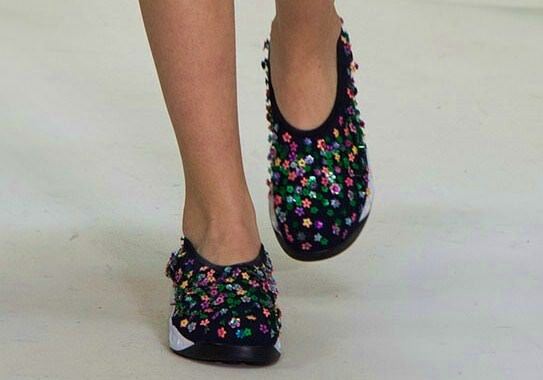 Designers like Christian Dior and Chanel flaunted their pumped up kicks adorned with sequins, pearls, and other embellishments on the runways of fashion week, and the runway looks are already hitting the streets. We are loving this trend and can't wait to see how it continues to grow! 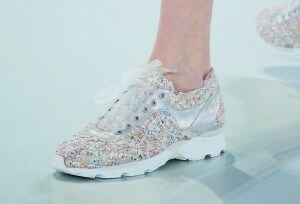 The designers at Christian Dior had models in athletic mesh shoes adorned with multicolored sequins. Chanel also took a bold fashion choice by dressing models in chunky sneakers embellished with tweed, shiny leather, and sheer laces giving the shoes an ultra feminine look. We are loving these designs and think this fun footwear trend will not only be popular on the streets, but will carry into prom. Many prom dress designers are photographing models wearing high-tops embellished with crystals, interesting textures, and zippers. Even though the Chanel version can cost up to $4,000, you can still get the look with other inexpensive designers and can even make a pair yourself with some time and creativity! Of course, if you love high heels, it doesn't mean you have to lose your pumps to rock sneakers at prom. Wear your heels to the dance, but bring the sneakers as your go-to comfy option once your feet start to get tired. 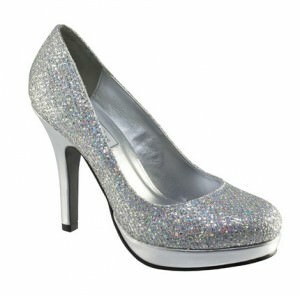 Or, keep the heels on all night and rock the sparkly shoes for after-prom! Would you rock sneakers to prom? Comment with your fashion opinion! This entry was posted in Shoes, Prom Shoes, Trends and tagged Trends, Prom Shoes, Woman's Shoes, Prom, Chanel, trend alert, Spring, shoes, Designer shoes, designer, Spring trends, trend, sequins, Spring 2014, sneakers, embellished, runway, Dior on February 26, 2014 by Marissa. Did you catch Jennifer Love Hewitt wearing Sherri Hill style 21154 on Season 2, Episode 5 ("Hell on Heels") of The Client List? We did! And, she looked so glamorous in it! We've been seeing a lot of prom dresses on TV lately, but this time the TV show wasn't about prom! In the "Hell on Heels" episode, Jennifer Love Hewitt's character, Riley Parks, struggles with whether or not her and her daughter Katie should enter the Beaumont Belles Mother/Daughter pageant. They of course end up entering the pageant, and Riley wears the beautiful two piece Sherri Hill dress shown above! Sherri Hill 21154 is a fun and flirty dress with an embellished crop top and accordion pleated tulle skirt. 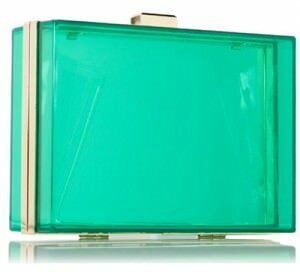 It comes in multiple color choices: aqua/pink, aqua/light green, coral/gold, and ivory/gold. Jennifer Love Hewitt wears it in the aqua/pink color on the show. Our favorite part of the outfit, though, may be those sparkly silver pumps she wore. It really completed the look! You can get similar sparkly heels with Touch Ups style Candice. You'll have Jennifer Love Hewitt's look from head to toe! We don't want to spoil the episode for you if you're a fan of the show, so make sure to watch it to find out if Riley and her daughter walk away with a WIN at the pageant! This entry was posted in Celebrities, Prom Dresses, Prom Shoes and tagged Sherri Hill, celebrities, celebrity, Best Dressed Celebrities, Celebrity Inspired Dresses, Celeb Style, celebrity style, celebrity dresses, TV shows, Sherri Hill 21154, Jennifer Love Hewitt, The Client List on May 6, 2013 by Chrissy Roos. The 2013 MTV Movie Awards aired last night (Mon, 4/15) and they were so much fun! Rebel Wilson's jokes were hilarious, as usual, and the live performances by Selena Gomez and Macklemore were full of energy. It's no doubt, though, that our eyes were glued to the red carpet. All of the ladies looked so amazing, but there were two celebs that we particularly loved: Crystal Reed and Greer Grammer! Their looks were so perfect not only for the red carpet, but to rock at prom, as well! Check out below what they wore and how you can get their looks for prom. This entry was posted in Celebrities, Faviana, Lace, Alyce Paris, Best Dressed, Cocktail Dresses, In The News, Prom Shoes, Red Carpet and tagged Cocktail Dresses, Jovani, short dresses, Red Carpet, celebrities, Mac Duggal, faviana, celebrity, alyce designs, cocktail party, layered skirt, Lace Dress, MTV Movie Awards, Best Dressed Celebrities, Celebrity Inspired Dresses, Cocktail, lace, Jovani Prom, Red Carpet Fashion, MTV, Celeb Style, Red, cocktail dress, short dress, Faviana dresses, Celebrity Fashion, tulle dress, jovani dress, celebrity dresses, alyce paris, short strapless dress, red dresses, short prom dress, Crystal Reed, Greer Grammer, black and white on April 15, 2013 by Chrissy Roos. Prom is only weeks away, and we're sure that you're ready to bust a move on the dance floor. But, before the biggest night of the year, you have to make sure everything goes perfect...down to the nitty gritty details! In order to have a stress-free night, try to get everything done way in advance and have a handy check list. We are here to guide you through this stressful preparation, so we came up with important tips to follow for your dazzling night! This is a great list to print out and keep with you in the coming weeks to make sure there's nothing you forget! Most of the time, dresses don't fit perfectly. You don't want to be uncomfortable and swimming in your dress! Go to the right seamstress and have her tailor it to your size and length. The length is especially important - you don't want it dragging on the dance floor. Make sure to bring the shoes you plan on wearing that night so that the seamstress can hem the dress properly. Your hair is crucial! Make sure you book your appointment early enough in the day to give yourself plenty of time to get ready for Prom - you don't want to be late! Search for hairstyle ideas online and in magazines and bring pictures in with you so that the hairdresser knows what you want. You should also consider how it will look with your dress. Up-dos and half up-dos are great for one shoulder or high neck dresses. Strapless gowns can go with just about any hairstyle. One fun way to keep track of the hairstyles you like and compare them to each other is to make a Pinterest board. You might want to book an appointment for makeup and nails also. You never know how crowded your favorite nail salon might be or how long the wait is for makeup. Getting a manicure and pedicure a couple days before is a great way for making prom day errands easier - just make sure that you don't chip them! If your prom dress is loaded with beads or has super bright colors, it's better to tone down your makeup and nails. Neutral nail colors and neutral eyeshadow colors are best with bright colors, lots of beading, and print. If you are wearing a neutral colored dress, you can go crazy...bold lips and bright nail polish for a pop of color! Jewelry is another important detail. It for the most part has the same makeup and nails rule; if you're wearing a blinged out sequin dress, you're going to want to tone down the jewelry. Otherwise, you'll have sparkle overload! Too much can overkill your whole look, so try to keep it simple. Your shoes are what completes your look. 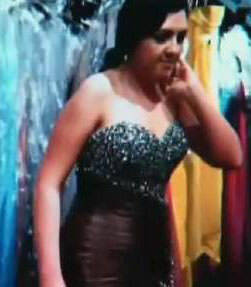 You don't want to look like your in pain in a gorgeous dress. Practice makes perfect! Try breaking them in a few weeks before. If that doesn't help, try slipping in padding or insoles. If your shoes are too tight, find a local shoe repairman and have them stretched out. You'll have a more confident walk! A purse is always a great way to add some personality to any outfit. 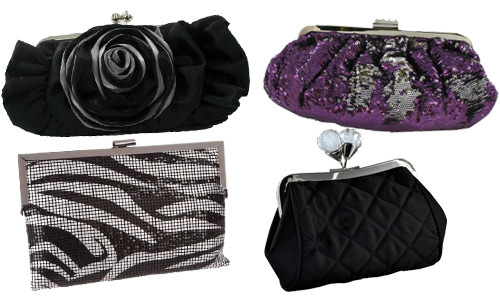 Pick a simple bag that blends in with your dress, or choose a funky clutch that's the statement piece of your outfit! Just remember, depending on your dress and jewelry, you don't want to be too blinged out. 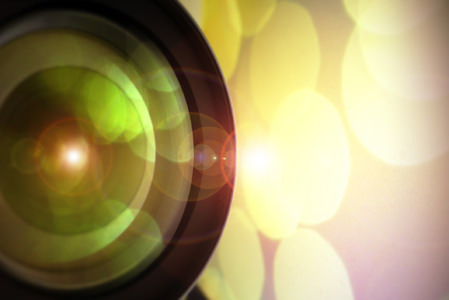 Of course, the most important accessory of all is your camera! It's a special night, and you'll want to take all the photos you can. Whether a disposable, a point-and-shoot, or the handy dandy camera on your smart phone, just make sure that you have plenty of room to take lots and lots of pictures. And, ideally, have something small enough that fits in your purse! This entry was posted in Prom Tips, Prom Dresses, Prom Shoes and tagged Prom Dresses, Prom Shoes, Prom, prom accessories, Prom dress, Prom shopping, fashion tips, prom tips, prom timeline, prom hairstyles, makeup tips, prom makeup, Prom Night, Prom Gowns, prom pictures, prom 2013, prom style, High School Prom Dress, Prom Season, High School Prom, prom hairstyles 2013 on April 3, 2013 by Marissa. What if you had spent nearly $1000 on your Prom dress, shoes, and jewelry, bought your Prom tickets, but then your date backed out and you were told by the school that you weren’t allowed into Prom without a date? Well, that’s what happened to one Wayne, Pennsylvania high school student. Seventeen-year-old, Amanda Dougherty was shocked when school officials from Archbishop John Carroll High School told her that she was not allowed to attend her Junior Prom without a date because of a rule made by the Archdiocese of Philadelphia. According to her father, Amanda had been so excited for a couple of years awaiting her Prom to finally arrive. In fact, she was so excited that she started dress shopping around Christmas time, where she spent close to $1000 for her Prom wear and tickets. She even compared dresses with her friends on a Facebook page that was ‘blocked’ so that the guys couldn’t see it. When questioned about the predicament, the office of Catholic Education responded with “there are numerous dances and events throughout the year where dates are not required, but we view the prom as a special social event where a date is required to attend.” What do you think? Should Amanda have been allowed to attend her Junior Prom? How would you have responded if the same thing happened to you? This entry was posted in Prom Dresses, Prom Shoes and tagged Tony Bowls, Prom, Dreams, banned, Amanda Dougherty, Wayne, PA, Philadelphia, Archdiocese, Junior Prom, $1000 on May 31, 2012 by Tim. Prom Hairstyles - Do It Up! Whether you and your friends rent out the whole salon on the day of prom or you are doing your hair yourself; the hairstyle you choose is not only a choice of your personality, but a huge finishing touch to that head turning entrance you are hoping for. Below is a few of our favorite options for your big night. We hope to inspire! This entry was posted in Celebrities, Makeup Tips, Prom Tips, Prom Dresses, Prom Shoes, Red Carpet, Trends and tagged Prom, prom hairstyles, Prom 2012, hairstyles, updos, pony tails, selena gomez, vanessa hudgens, lc, lauren conrad, hilary duff, katy perry, christina aguilera, jessica simpson, braids, side pony, retro, curly, straight, waves, long hair, short hair, prom hairstyles 2012, hair on November 9, 2011 by Marissa.